I really wanted to find a dress that I thought would fit in with my idea of this wedding as well as something I would wear. Now I'm not sure that this dress would look remotely flattering on me but I think it's perfect. The ruffles totally sold me even though I would normally run from something that had ruffles in the description- these just look fun and flirty. Something about the skirt just reminds me of the dresses worn by tango dancers. And the back on this dress is just WOW -I know there would be no hope for a bra (another reason I'd probably have to skip it) but I really like it! 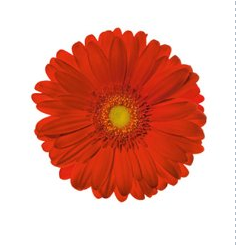 My bouquet is going to be made up of one type of flower, red-orange gerber daisies (my favorite) and be slightly larger than my bridesmaids' bouquets. wow they're just like my dress, what a coincidence!